Laser has met its match. One never thought the laser printer would meet its match. From the inkjet family, we used the HP OfficeJet Pro 3620 Black & White e-AIO to show you how. We picked an office that just cannot do without a laser B&W printer, offered them the HP Officejet Pro 3620 B&W e-AIO for a short trial of one week and decided to let them tell the difference. Mr Raviraj Chodankar is an Advocate who has been running a successful practice in Panjim since 2002. He prints an average of a whopping 6,000 pages a month! Everything ranging from complaint copies, deeds, agreements and other legal documents. His office runs on two Canon printers that require cartridge changes once in 45 days. Being an advocate, Raviraj requires high-quality black and white documents for all his legal dealings and swears that he cannot think of an alternative to his trusty laser printer. But in less than a week, he realised that an inkjet can be as good. Raviraj found himself in a difficult situation one day. He urgently needed to print a document from his mailbox so his colleague could hand it over to his client waiting in their office. Thankfully, he remembered the on-the-go printing feature that allowed him to cue prints via his mobile device. With a simple click of a button on the HP ePrint app on his smartphone, he was able to send a print request all the way from his home. Such a time saver! The second convincing factor was the cost of printing, a major deciding factor for any growing business. Raviraj naturally keeps stock of every rupee he spends. Here too, this inkjet trumps his laser, with a 50% lower energy consumption and the capacity to print up to 1,600^ pages for just Rs. 999* per cartridge. He quickly did the math and realized that’s about 60 paisa per page in comparison to the 1 rupee 10 paisa he was spending earlier. However, he is not the only one who is pleased with the HP Officejet Pro 3620 B&W e-AIO. His staff are enjoying laser like print speeds of 19 pages per minute, easy sharing with network capability! That’s unbeatable efficiency, as far as they are concerned! But that’s not all. A duty cycle of 12,000 pages means Raviraj need not worry about those busy months, with endless print outs. Enough about the advantages, let’s get down to business – print quality. “I really couldn’t tell the difference between a laser and the HP Officejet Pro 3620 B&W e-AIO. It was a blind test which I failed more than once.” said Tapasya Vernekar, a colleague of Raviraj. With fast drying, fade-proof and water resistant ink, it's really hard to tell the prints emerged from an Inkjet printer! And as if that was not enough to be happy about, this inkjet from HP is also an all-in-one (AIO), which means it can Print, Copy, Scan and Fax, without any added peripherals. For a small business like Raviraj’s, it means a whole lot of space saved. The staff can now save the trouble of going to multiple machines for print, scan, copy, fax jobs. The Two-sided Printing feature has Raviraj and his team doubling up in joy. No more paper wastage and huge savings in cost as well! But here’s the best feature of them all. It does everything noiselessly. 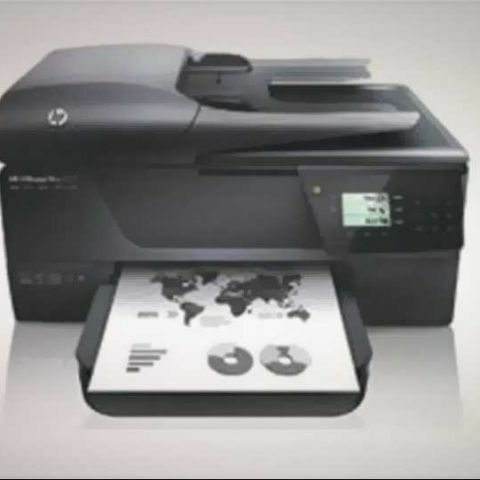 The HP Officejet Pro 3620 B&W e-AIO works silently, diligently and gets the job done without a sound. We can also get additional peace of mind with a free 3-year onsite warranty; but it’s time to check Raviraj’s verdict. He also thinks that the HP Officejet Pro 3620 B&W e-AIO is a sleek machine loaded with features and specially designed for businesses like his. More features. Same price. Laser has met its match! ^ISO page yield for black HP 960XL cartridge under standard test conditions. * MRP (Inclusive of all taxes) for one HP 960XL cartridge. Deskjet printer or Laser Printer? Which is the best monochrome laser printer within 5k. My laptop has NANYA 2GB RAM on it and i want to add another 2GB to it. Kindly suggest the best match for it. Which MF LASER Printer will you suggest me?